Last week's CES show was undoubtedly all about new technology in television sets, with the emphasis on kinds and sizes of screen. Naturally, there were noteworthy developments inside the boxes too. One of the more significant was Toshiba's prototype HD TV powered by the same Cell processor found inside the PS3. 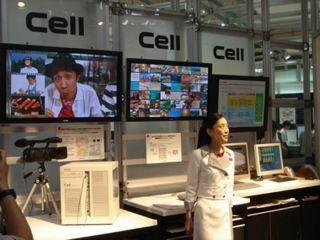 Similar proof-of-concept models were on show as long ago as late 2005 in Japan, but those were limited to standard-definition MPEG-2 video streams. The latest device adds the ability to display six HD TV channels simultaneously to a stunning 48 standard streams at the same time. According to IT World's video report, the point of simultaneous streaming is to allow viewers to choose channels by flicking through broadcasts in the way they can leaf through photo thumbnails on a computer now. Additional tricks in the Cell's bag include upscaling video to near-HD quality, zooming in on areas of the image and enhancing those too, and pretty much anything bar gaming. Toshiba says it has no plans to create an HD TV/PS3 hybrid device, nor does it have firm plans for commercialisation of Cell-powered TV sets.